Helping you find balance in your budget and everyday life. Money Saving Tips, Recipes, DIY Projects, and More. It’s no secret, that Fall is my favorite season! One of the best things about Fall is the home decor. This time of year, all things cozy are trending. Think throws, faux fur rugs, and accent pillows! While I love to switch up the accent pillows on my sofa, they can get pretty expensive. That’s why I started making a few of my own. These DIY Fall accent pillows are super affordable as I used items from the Dollar Tree. I absolutely love how this pillow came out, so I plan to make a few more. It also only took me about 30 minutes and was so easy to make. There is no sewing required for this pillow, so it’s extremely beginner friendly. The first thing you’ll need for this craft it a plain accent pillow. If you have any old accent pillows laying around your house that can be repurposed, feel free to use one of those. If not, try checking out the Dollar Tree or Walmart. The pillow that I will be using today is from Walmart, and it cost me less than $5. I recommend using a neutral-toned pillow so that the colors of the leaves will pop. 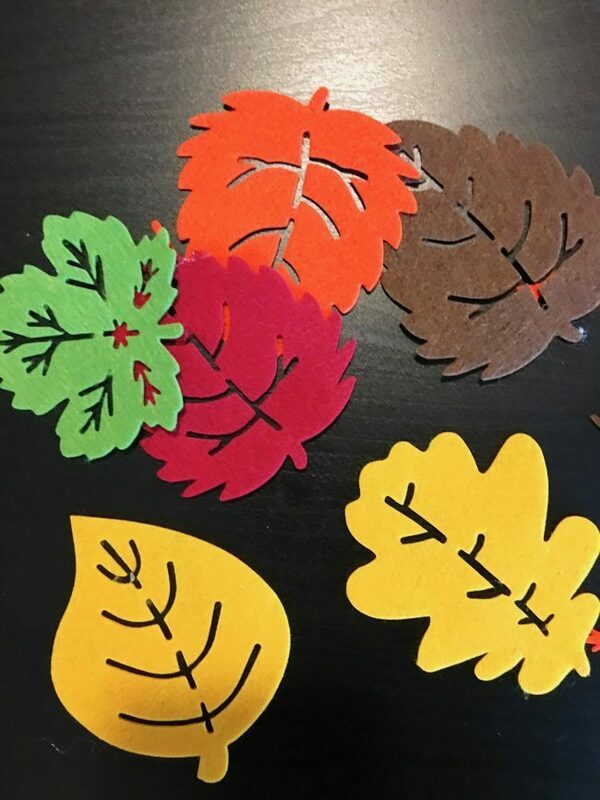 The next thing you will need is a pack of multi-color felt leaves, which can be found at the Dollar Tree. I purchased one pack, which includes 20 felt leaves. 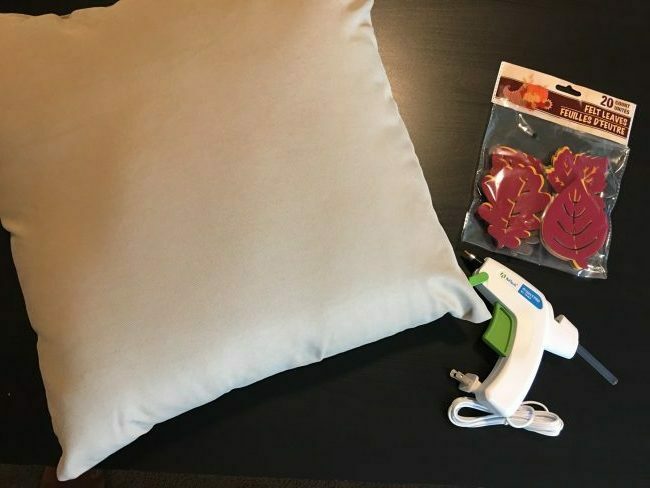 This worked perfect for the pillow that I used, and I even had about 4 leaves left over. Feel free to grab an extra pack of felt leaves just in case to be on the safe side. You’ll also need a hot glue gun to make this project. Any hot glue gun will do. Gather all of the above supplies. 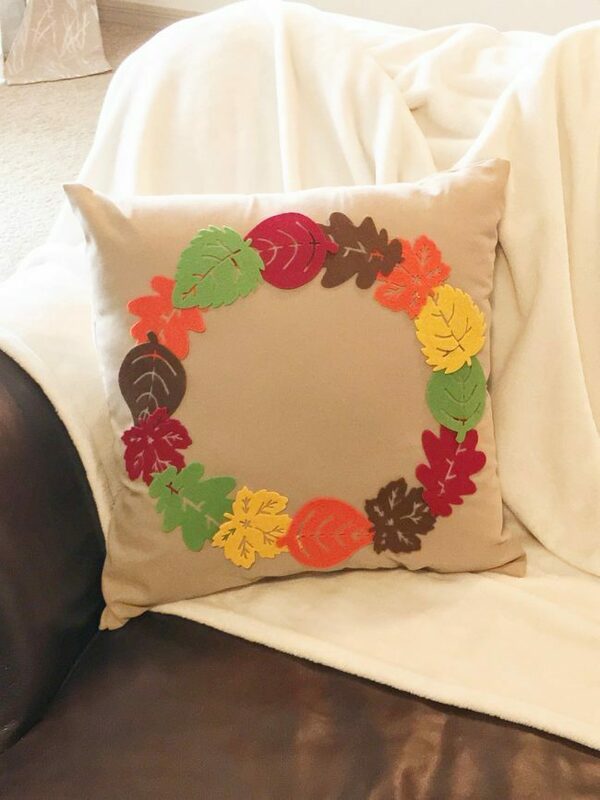 Optional step: Before you actually begin gluing the leaves to the pillow, lay the leaves on the pillow in the wreath pattern just so that you can get an idea how you will arrange them. Decide if you want to lay them in a particular order by color/shape. For example, I tried doing a “green, yellow, orange, brown, red” pattern the whole way around to keep the colors spaced out. I also mixed up the leaves as I went around the pillow. I left my leaves on the pillow after doing this, so that I could remember the pattern. Plug up the hot glue gun, and allow it to heat up for about 5 mins. Next, apply the second leaf this time making sure that it slightly overlaps the first felt leaf. Continue to apply the felt leaves in a circular wreath shape on the front of the pillow until you complete the wreath shape. 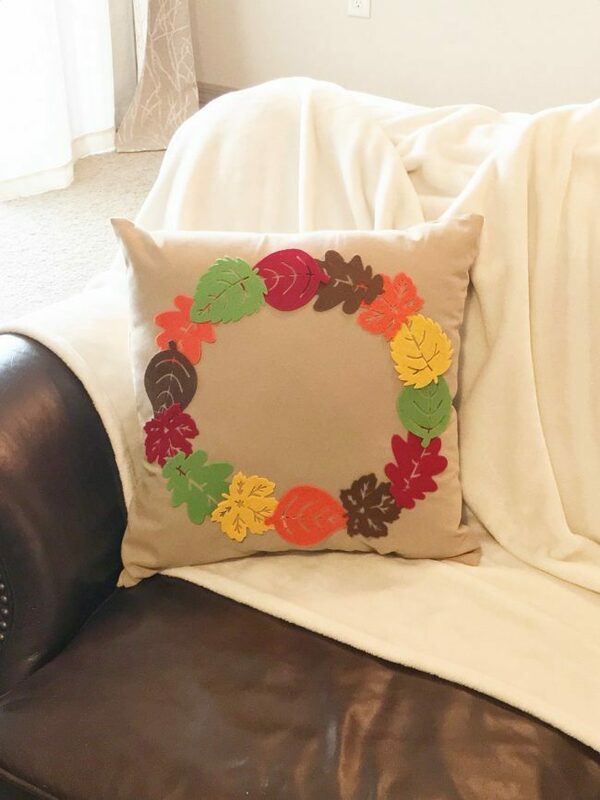 This DIY Fall Accent pillow is sure to be a cozy addition to your Fall home decor. It looks great with a nice and cozy Fall throw. I hope that you enjoyed this DIY Fall accent pillow tutorial! Let me know if you have any questions in the comments.